In the range of energies penetrated by the LHC accelerator, a new mechanism of particle creation is becoming more prominent, say scientists from the Institute of Nuclear Physics of the Polish Academy of Sciences in Krakow. The energy from collisions is now so great that some of the elementary particles, mesons containing charm quarks, are beginning to emerge in pairs as often as single ones—and even more often. A proton-proton collision is an extremely complex physical process of interactions that results in the creation of a variety of particles. Researchers at major particle accelerators including RHIC, Tevatron and now the LHC, have observed D0 mesons appearing singly. Recently, however, the LHC has been accelerating protons to their limits, and an interesting effect has been observed: Where once only solo D0 mesons were formed, they are now appearing in pairs. Scientists from the Institute of Nuclear Physics of the Polish Academy of Sciences (IFJ PAN) in Krakow have explained the essence of this phenomenon and showed that increasing energy plays a dominant role in the production of charm particles. The latest research, published in the journal Physics Letters B, was carried out in cooperation with Russian physicists from the Samara National Research University. "A few years ago, we predicted that collisions of protons at sufficiently high energy should result in more charm mesons produced in pairs rather than alone. Our latest publication not only describes in detail why this happens, but it also proves that in the LHC this effect is clearly visible," says Prof. Antoni Szczurek (IFJ PAN). According to the Standard Model of particle physics, elementary particles perform different functions. 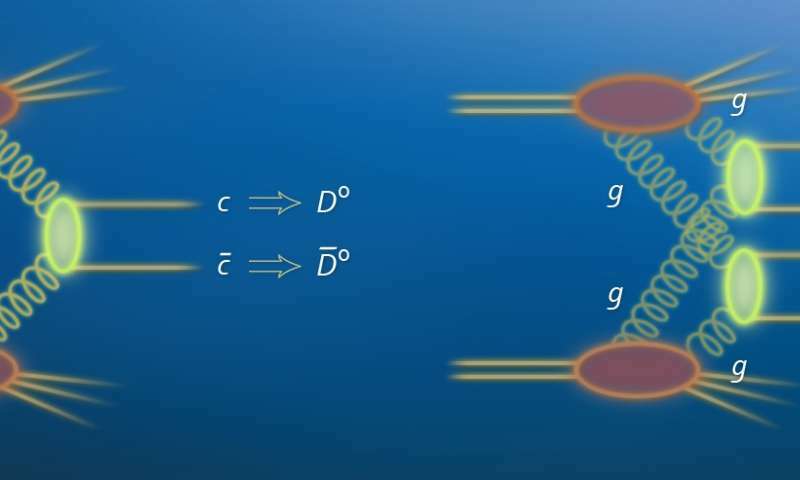 Bosons are carriers of forces: Photons are related to electromagnetism, gluons are responsible for strong interactions, and bosons W+, W- and Z0 mediate weak interactions. Matter is formed by particles called fermions. These include leptons (electrons, muons, tau particles and their associated neutrinos) and quarks (down, up, strange, charm, beautiful and top). The first three types of quarks are called "light" while the last three are called "heavy." In addition, each quark and lepton has its antimatter partner. Complementing the whole is the Higgs boson, which gives particles mass (except for gluons and photons). In our everyday world, heavy quarks are present in small amounts and only appear for an extremely short time, mainly in the Earth's atmosphere. All visible and stable material of which atoms are constructed, including protons and neutrons, consists of up and down quarks. But when it comes to collisions of particles at sufficient energies heavy quarks may arise. The dominant process in the creation of charm quarks (the least massive heavy quarks) is the fusion of two gluons. In the LHC, this occurs during proton-proton collisions, formed by the merger of quark-antiquark pairs. Neither a quark or an antiquark can stand alone, so they quickly form pairs with other quarks. When one of the quarks is a charm quark, the particle is called a meson D; when one of them is a charm antiquark, an antimeson D is the result. "At lower energies, two particles usually arise from a collision: The D0 meson and its antimeson. We have shown that the energies at the LHC, however, are so high that in the course of a collision, gluons are not scattered only once, but twice or even more. A single collision can give rise to numerous D0 mesons, plus, of course, appropriate antimesons," explains Prof. Szczurek. Physicists often call quarks and gluons "partons." The phenomenon of multiple parton scattering is already well known, but had previously been unaddressed because it never played a significant role in the investigated processes. Now, scientists at IFJ PAN have shown that the situation has changed. Energies of accelerators are already so high that multiple parton scattering has become the leading mechanism responsible for the production of charm mesons and antimesons. Theoretical analysis of the measurements collected were supported by a group at the LHCb, leading one of the four major experiments carried out at the LHC. "The data from the LHCb experiment have shown many cases where, instead of one D0 meson, we have two of them. It is precisely the effect that we expected: Production of twins is becoming as likely as the production of single mesons. In future accelerators, such as the Future Circular Collider, the LHC's successor, this phenomenon will play quite a dominant role in the production of charm particles. Perhaps then we will see collisions with a resulting effect of not only two, but three or more D mesons," says Dr. Rafał Maciula (IFJ PAN). Potentially, multiple parton scattering can lead to the formation of mesons containing other heavy quarks, such as beauty quarks. The calculations of Krakow physicists, however, show that at current energies of collisions in the LHC, these processes are much less likely. It has to do with the masses of the quarks: The greater the mass, the less likely they will be produced, and beauty quarks are significantly heavier than their charm counterparts. "For now all we can say for sure is that the production of twin charm mesons seems to be much more likely than twin beauty mesons," says Prof. Szczurek with a wink. The analysis and prediction of physicists from the IFJ PAN are important not only for the future designers of large particle accelerators, but also for contemporary experiments on the registration of neutrinos coming from outer space, such as the famous IceCube detector in Antarctica. Physical and technological limitations mean that neutrino detectors cannot be built in space. Meanwhile, there is a risk that some of the neutrinos registered by the device on or below the Earth's surface are formed by the action of high-energy cosmic rays in the atmosphere of our planet. Colliding with atoms and molecules of the atmosphere, cosmic rays can, in fact, create charm quarks, which are then transformed into short-lived D mesons. The problem is that some of the decay products of D mesons may just be neutrinos and antineutrinos. Research on multiple scattering of partons can therefore help in determining how many neutrinos observed in detectors actually came from the depths of space, and how many are just noise resulting from the presence of the atmosphere. Is this the trailer for the upcoming LHC blockbuster?